Engineer (Civil/Electrical/Mechanical) Posts. 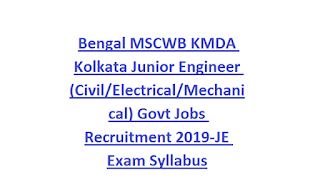 Online applications for this WSCMB KMDA Junior Engineer (Civil/Electrical/Mechanical) recruitment 2019 will be available from 13-02-2019 to 15-03-2019. Official website to apply online is www.mscwb.org for this JE jobs. There are total 150 JE jobs in this MSCWB KMDA recruitment 2019. Candidates selection will be based on written exam and interview. 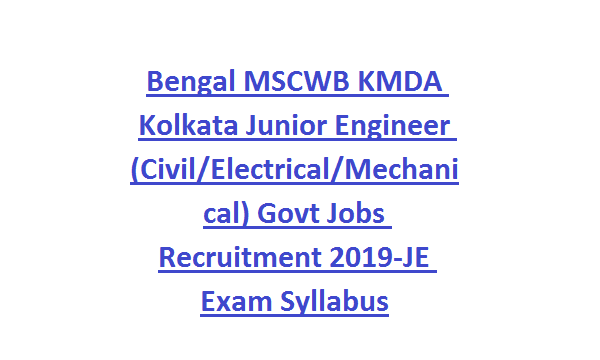 More information about this Kolkata Metropolitan Development Authority KMDA MSCWB Junior Engineer (Civil/Electrical/Mechanical) recruitment online application process, JE age limits, JE qualification, JE Exam Pattern and Syllabus, other details are given below. There are total 150 Posts are in this KMDA JE recruitment 2019. For JE jobs in KMDA upper age limit is 21-32 years as on 01-01-2019 . For OBC candidates upper age limit is 03 years and for SC/ST 5 years of age relaxation is given. Candidates must have qualified Diploma in Mechanical Engineering or Electrical Engineering or Civil Engineering for applying this Junior Engineer posts MSC WB Recruitment 2019. Application fee is Rs.150 + Processing Charges Rs.50 + Bank Charges Rs.20 for General and OBC candidates. For SC/ST & PH candidates have to pay only Bank charges and Processing Charges. Candidates selection for this MSCWB KMDA JE jobs is based on written exam and interview. Total 100 questions will be given. Each question carries 2 marks. Exam Syllabus will be Diploma level Engineering Subject. Online applications only accepted for this MSCWB KMDA recruitment of Junior Engineer posts. Last date to apply online is 16-03-2019. Official website for online is www.mscwb.org for this AE Civil jobs.